For more options, please send us a custom request. If you want to give your office supplies a personal touch it is a good idea to print notepads with your company logo. Custom notepads can be for your own usage, for employees or you give them away as promotional notepads. Our customers use personalised notepads for different purposes: Logistic companies need custom notepads to document work sequences. Hospitals and doctors need printed prescription pads for their patients. Advertising agencies use promotional notepads as a useful give-away for their clients. Gastronomy notepads have a special size that is common in restaurants. To sum up printed notepads are a well-known helper in and outside the office. 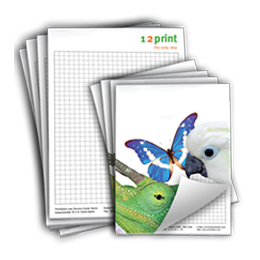 We offer notepads in all common sizes and with different choices of paper. You can choose notepads with an extra cover paper, with punched holes and the glue binding can be on the short or the long side. To create the design for individual notepads we recommend using our file templates, but if you don’t have the time or the skills to create a print-ready file you’ll get your custom notepads anyway. Just choose our layout service and provide us with the logo or any graphics you want and we’ll do the job for you. Notepad Printing can’t be easier!